As we’ve seen in our recent posts, public speaking anxiety can be a huge obstruction to expressing your personal brand. As a follow-up to our last post on cognitive approaches to alleviate anxiety, we now turn our attention to a tried and true behavioural approach – exposure! Consider this paradox: the most effective way to maintain any type of anxiety is through avoidance. In fact, it’s a fantastic way to feed it! So if that’s not your end goal, the best strategy is to “stare down the demon”, or in the case of public speaking, stare down your audience (after all, they are hardly demons, regardless of what that inner-critic has told you!). Behavioural techniques such as exposure are just as important as cognitive restructuring and should be used in tandem. While exposure therapy is generally conducted by a therapist in the context cognitive behavioural therapy, exposure techniques can be practiced as part of your own self-improvement plan. The idea behind exposure is that you need to be exposed to anxiety-inducing situations to become desensitized to them and eventually overcome your fear with new learning. Instead of throwing yourself into the deep end, however, exposure involves taking small steps and goals that build to a larger public speaking anxiety goal (i.e., giving a presentation). This is accomplished by creating what’s called a “fear hierarchy”, a list of scenarios involving anxiety-inducing situations, each more intense than the last. The objective of the fear hierarchy is to gradually and systematically expose you to anxiety-inducing situations. Starting with the least anxiety-provoking situation, you begin exposing yourself to the items on the list. For the exposure to work, you will need to stay in the situation long enough that your anxiety decreases. As you become comfortable, you move up the hierarchy to increasingly difficult situations. If you find that a situation is still problematic, you will need to do repeated exposures with that situation until your anxiety subsides before moving on to the next one. Below is an example of a fear hierarchy. Of course, you will need to tailor yours to your specific fear situations in order to be most effective. 1. Read a newspaper passage in front of a friend. Choose a passage that you think will interest a friend or family member and ask if you can read it out loud. 2. Attend a lecture and ask a question. Scan the newspaper for upcoming seminars or lectures, attend one that interests you, and make sure to ask at least one question of the person giving the talk. 3. Ask a question or make a comment during a work meeting. Instead of staying quiet during a work meeting, decide to make a comment or ask a question. This is a great chance to prepare ahead of time so that you can develop confidence and overcome anxiety. 4. Make a toast at a party. If you attend a dinner party, instead of letting the more outgoing guests monopolize the toast process, offer to do it yourself. 5. Offer to present at a book club meeting. Join a book club, and when it comes time for someone to speak about a particular book, offer to do the talking. 6. Give a talk at a school for career day. Offer to go to your son or daughter’s school for career day and talk about what you do for a living. 7. Take a class to give a presentation. Find a class that you can take that will require you to do an oral presentation. 8. Take a drama class. Many shy actors took drama courses as a bid to overcome social anxiety. 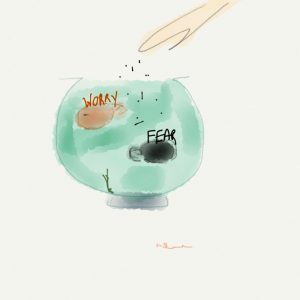 You can do the same and also use the experience as a stepping stone on your fear hierarchy. 9. Take a public speaking course. Enroll in a course specifically about public speaking. 10. Join Toastmasters. Participate in a group designed to help build your public speaking confidence and overcome fears. The most effective way to practice exposure is “in-vivo”. However, exposure can also be practiced with imagery before tackling the real thing. “Imaginal exposure” is best done with a therapist or other person to guide you through the imagery, however preparing a detailed description or recording of the feared situation can also be effective. Whether doing imaginal or in-vivo exposure, it’s important to identify and challenge the automatic thoughts that emerge (refer to our last post for help with this!). It’s also essential to “sit” with the anxiety and not fight it so that your body habituates by learning that it will naturally pass on its own accord. In addition to cognitive restructuring and “acceptance” of anxiety sensations, relaxation and breathing techniques are effective behavioural strategies to add to the mix. There are tons of great resources online to check out. Last but not least, let’s not forget skills training. Polishing your public speaking skills will help reduce anxiety by building confidence and competence. Learning and practicing these skills can reduce the ambiguity of the situation and diminish anxiety. There are also organizations like Toastmasters International that are specifically created to help people learn, practice and improve public speaking. These workshops are ideal for exposure too! Of course, if your public speaking anxiety is more severe and self-help strategies are not sufficient to reduce your fear, I would encourage you to get in contact with a mental health professional or your GP for a referral. Now get out there and expose yourself!